Can’t you just taste it now? The Washington Island Fishboil Festival will take place for the fifth year in Berwyn, Illinois, on Feb. 2. The fifth annual Washington Island Fishboil Festival (WIFF), hosted by Island musician Julian Hagen, is scheduled for Feb. 2 at FitzGerald’s in Berwyn, Illinois. FitzGerald’s doors will open at 3:30 pm, with the first whitefish boil-over in the parking lot next door set for 4:30 pm. Attendees are invited to arrive early to observe the fish-boil preparation. 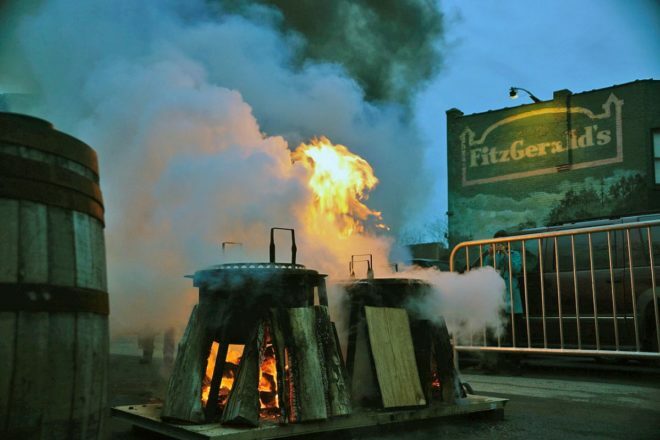 Almost 300 fish-boil dinners were served at FitzGerald’s at the 2018 event. Commercial fisherman Kenny Koyen will again be the boil master. Dinner features freshly caught whitefish, red potatoes and onions, all boiled in a large kettle over an open wood fire, then quickly served with butter, coleslaw, baked beans, corn, bread and dessert. Koyen will also offer Islander Jerry Mann’s broiled bratwursts with the same trimmings, and Kate from Fiddler’s Green Irish Pub will serve Mediterranean vegetarian/vegan fare and baklava. Music on the main stage will start at 4:30 pm and run throughout the evening. Early music will be easy-listening folk/country. Starting at 6:45 pm, The Seat Of The Pants Band will take the stage. Guest performers will include Peter Quinn, Paris Schutz, Rick Gourley, Andon Davis and Julian Hagen. A jam session will take place in the party room at FitzGerald’s. Island-connected “Door” prizes will be drawn throughout the evening. FitzGerald’s is located at 6615 Roosevelt Road, Berwyn, Illinois. Admission is $15 per person and free for children ages 12 and younger. Food and drink cost extra. Reservations are required. For more information, visit fitzgeraldsnightclub.com.